Learning Hub Retail eCommerce What does it cost to sell parts online to consumers? You may have been thinking about developing an ecommerce storefront but just can’t decide if the benefits outweigh the costs. In terms of what is costs to sell online, the answer is, “it depends.” Why does it depend? Just like if you were to answer “how much does a car cost,” there are various elements that impact the cost. Depending on your ecommerce solution, your online storefront investment can range from $250-$6,000 per month. That sounds like a wide range, but that range depends on the manufacturer, how many brands you have, how much you spend on marketing, and most importantly -- who you choose as your ecommerce partner. As you can see, you pay a base price, and from there, the difference in monthly fee comes from Search Engine Marketing (SEM) spend. This is a subscription-based model with a twelve-month contract. To learn more about the importance of investing in SEM, click here. 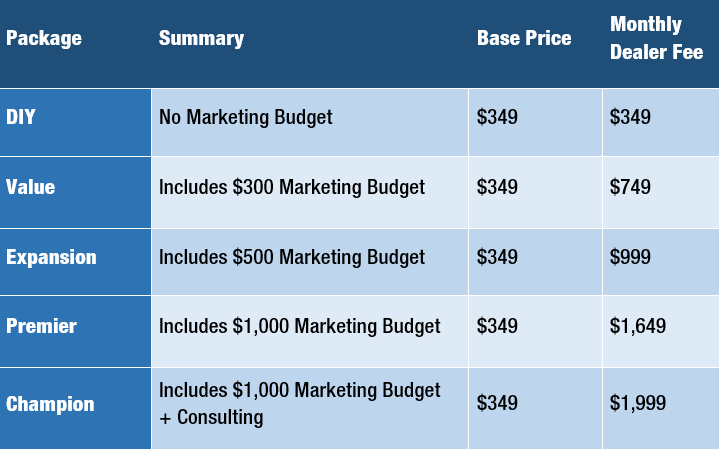 What is the difference between the marketing budgets? Spending more on the marketing budget should produce more online sales. Accordingly, you do not want more orders than you can process, nor do you want less than the investment. Processing online orders involves corresponding with the customer, verifying the correct part is ordered, weighing, packaging, shipping and occasionally processing returns. As you get into the game, choosing the right marketing budget that meets your business goals is important. Online sales could be a great incremental revenue stream requiring little additional effort. Alternately, this could be a huge profit center requiring a dedicated staff to process online orders all day long. When choosing your ecommerce solution, make sure your dollars are used well enough that the money you invest gives a great return. For example, you will want to make sure all of your marketing dollars are put to good use. If you’re paying $1,000, make sure every dollar is used. Be wary of any hidden costs. You don’t want to agree to one price and then pay another (or more fees on top of fees). Make sure to ask during the sales process what the entire cost is, any additional monthly costs along with a breakdown. For information about why you should get embrace selling parts online, read more here.